We stand here today as members of the Philadelphia Family Unity Network to celebrate the historic victory of ending ICE holds in Philadelphia. 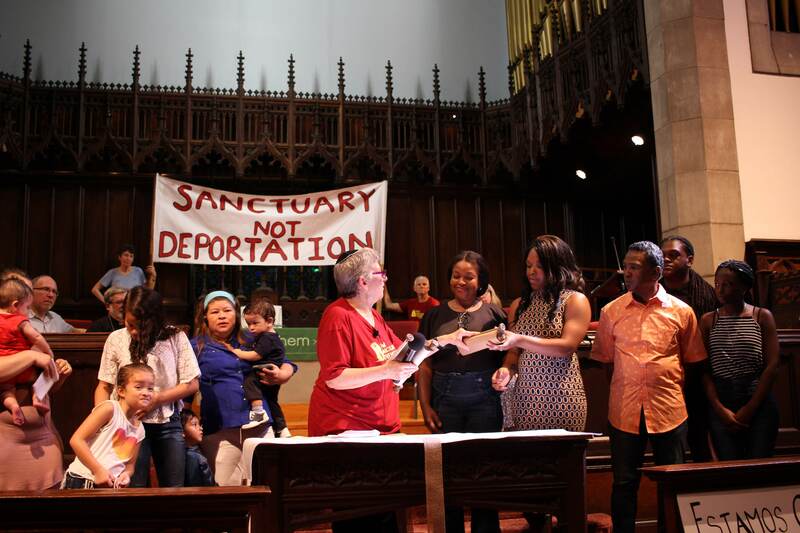 This moment represents years of organizing, coalition building, and hard work by community groups across Philadelphia against immoral deportation policies. It also represents successful partnerships with Mayor Nutter’s administration and City Council, who have worked alongside our community organizations to make Philadelphia a more welcoming city. Today, we are proud to show what a community united for justice looks like in Philadelphia. Our coalition led this campaign by building strength and solidarity across all communities, and fought for the rights of all individuals to remain in the city they call home, including our members and our loved ones who are currently or formerly incarcerated. On March 12th at the City Council hearing on ICE holds, Director of Public Safety Michael Resnick testified on the city’s draft of their ICE hold policy. By requiring ICE to obtain a warrant, the policy would end the use of ICE holds in Philadelphia. Talks with the administration and the PFUN coalition have confirmed that the language presented at city council last March will be the language used in the finalized executive order.Philadelphia police and prison staff have already been instructed to ignore ICE holds, and not to contact ICE regarding the release of an individual from the criminal system. We are incredibly proud to say that we will now have one of the most progressive policies in the country, which puts Philadelphia in the vanguard of local governments seeking to end police and ICE collaboration, and will send a clear message to the nation and President Obama that Philadelphia will no longer participate in the mass deportation of our families, friends and neighbors. As we continue to work with our local and national allies to end deportations and stop the unjust practice of police and ICE collaboration, we are also proud that Philadelphia is leading the way on how to begin dismantling the deportation machine and in becoming a truly welcoming city for our communities. On this historic day, we also grieve for the many community members who are not here today because they are detained or have been deported through ICE holds and other mechanisms of mass deportation. We honor the contributions that our missing loved ones made to the Philadelphia community and we will continue to organize to keep all Philadelphia families together. We look forward to continuing to build on this victory for our people, and in working with the City of Philadelphia and the Philadelphia Police Department on effective oversight and implementation to ensure that Not One More ICE Hold is enforced. We are here today speaking on behalf of the Philadelphia Family Unity Network core members, including 1Love Movement, Juntos, New Sanctuary Movement, the Pennsylvania Immigration and Citizenship Coalition, and Victim/Witness Services of South Philadelphia. Most importantly, thank you to the immigrant community leaders who, despite the risk and pain, worked for years to defend our families and the right to remain in our chosen communities. We have worked, organized, shared our stories, brought our communities together, learned from each other, marched, prayed, and – finally – WE WON!